Animal products are designed for animals who have thicker skin and coarse hair, protecting them from the toxic effects & skin absorption. Children are often treated for head lice, and as their skin and hair is substantially thinner, and they do not require a lot to become affected, they are much more susceptible to toxicity. all highly likely to occur during treatment of head lice infestation. Some small animal products (e.g. Spot-On) contain fenthion, an organophosphate. There are a large number of organophosphates of varying toxicities available. Organophosphates are widely used as agricultural insecticides and as household pest control agents. Organophosphates are highly toxic and may be absorbed through the skin. In very low concentrations some less toxic organophosphates have been used in head lice products for human use e.g. Derbac M which contains malathion. Fenthion is approximately three and a half times as toxic as malathion. Derbac M contains 0.5% malathion, compared to up to 20% fenthion in the Spot-On products. In total, volume for volume, Spot-On could be considered to be up to 140 times as toxic as Derbac M.
When applied to the skin, imidacloprid can be absorbed and cause systemic poisoning. Although this is unlikely following a one-off dermal exposure, there is no information on its use in humans so it is not possible to comment on its safety. Imidacloprid may also cause an allergic dermatitis, particularly in asthmatics or those who have many allergies. Imidacloprid is currently under investigation in the United States for use in humans to treat head lice. One study providing preliminary data found that a concentration of 0.2 % on an adult was effective and safe. However, Animal Products (e.g Advantage Flea Treatment) contain about 10 % imidacloprid, a 50 x greater dose. Lindane is a toxic pesticide which was once used in New Zealand to treat head lice. It kills very slowly and does not kill all ova, allowing ova to survive and prolong infestation. Its widespread use has allowed resistance to develop. Lindane also carries the risk of human toxicity. Severe adverse reactions have been reported, including seizures. Blood and renal disorders may also occur. Fipronil has limited skin absorption but may produce symptoms in cases of prolonged contact, particularly skin irritation. Although unlikely, systemic symptoms may include excitability with muscle twitching, irritability, tremors and at higher doses even convulsions. Prolonged contact can result in significant skin irritation and burns. Solvents can very easily run into the ears, nose or eyes, potentially causing serious damage. Furthermore, solvents are flammable so exposure to ignition sources, such as cigarettes or heaters have resulted in severe burns in children. 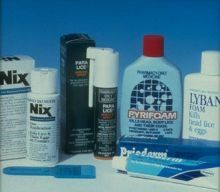 Synthetic pyrethroids, such as found in fly-sprays, are not recommended as treatment for head lice. Products often contain solvents as carrier liquids and hydrocarbons as propellants. Although only slowly absorbed through the skin, effects on the scalp can include burning, itching and tingling or numbness to the face. Inhalation from spraying around the head can produce dizziness, headache, weakness and fatigue, and even effects on the heart. Spraying pyrethroids around the head also presents a moderate danger if sprayed in the eyes. Some therapeutic preparations may contain similar compounds, however they are generally less toxic, in lower concentrations and found in cream or shampoo bases, as opposed to hydrocarbon aerosols or solvents. Pharmacy medications have gone through extensive tests to show that they are suitable for their intended use. However, the manufacturers instructions must be followed, or poisoning could result. The normal advice is to treat once, and repeat seven days later. Insecticide resistance in head lice is common, but it can be detected by assessing the effect of treatments. If live lice are found in the combings after treatment that has been correctly applied, the head lice are probably resistant to the product used, and a product with a different active ingredient may need to be tried.. The various pesticides marketed for control of head lice are toxic to the patient in varying degrees and lead to the development of resistance. Other alternative treatments are of unknown safety, and some are highly dangerous. Thorough regular combing, with an effective comb, treats the infestation by removing the nits. Furthermore, the issues of resistance and toxicity do not apply with this mechanical lice removal method.